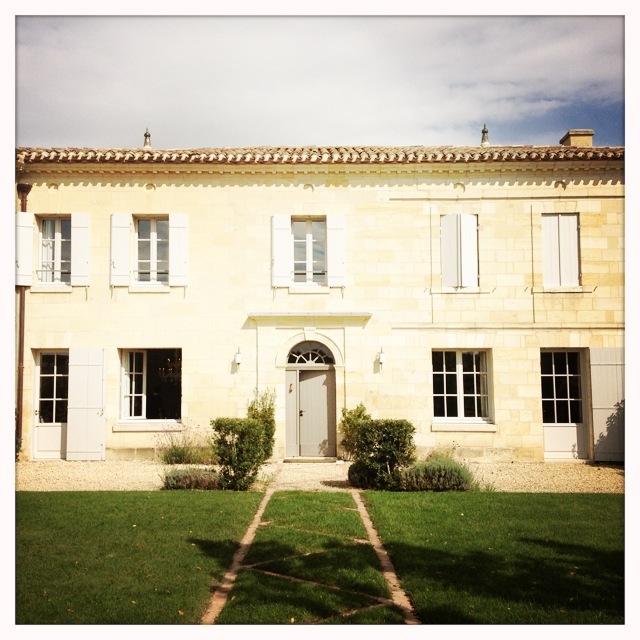 We admit, when we pulled up to Chateau Soutard, we were pretty impressed with the size of the Chateau. A cooking class here? Sign us up! Alas, due to the renovations, we found ourselves in the car on a winding road following a member of the staff to another smaller chateau owned by the estate where we would be cooking that day. 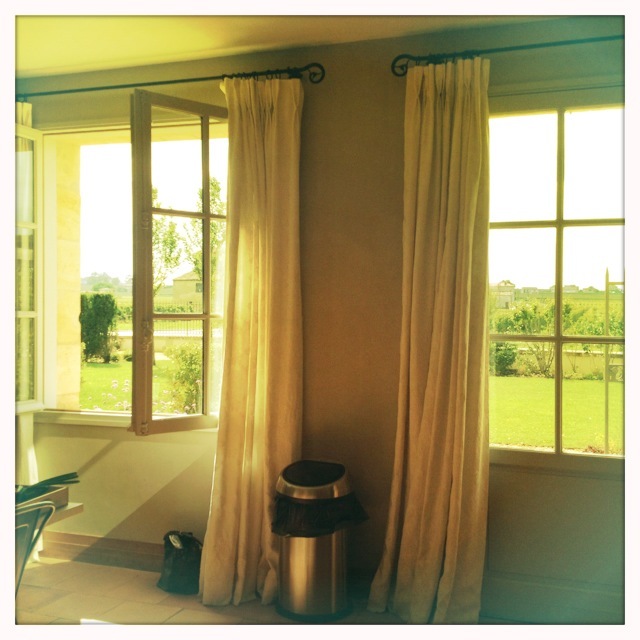 Truly, it was a charming place, and we warmed up to it, and Chef Phillipe, right away. It didn’t hurt that the sun had suddenly come out, and the whole kitchen was bathed in a golden yellow glow. A smaller home on the estate, where we did our cooking class. The sunlight streaming into the kitchen. Chef Phillipe was a former restauranteur in Paris at some very notable places, and most recently has begun training other chefs and restauranteurs in how to run a successful food service business. He also teaches some cooking classes on the side to fortunate folks like us. Bob Watt and Chef Phillipe Scandrol. 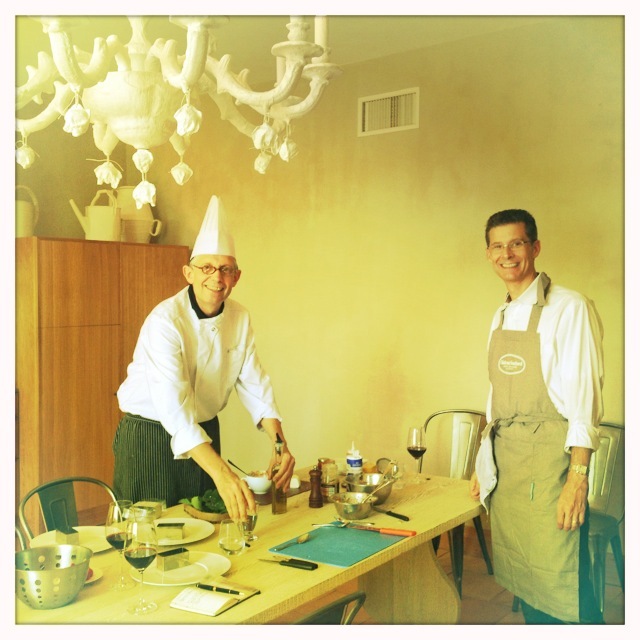 A good-natured and efficient man, Chef Phillipe made us feel at home in the kitchen right away. Almost too much so in the beginning though. After pouring us a glass of wine, he pulled out a device that he said he found on a trip to the States. He saw it on a TV infomercial for $19.99, and found it to bring home to France. 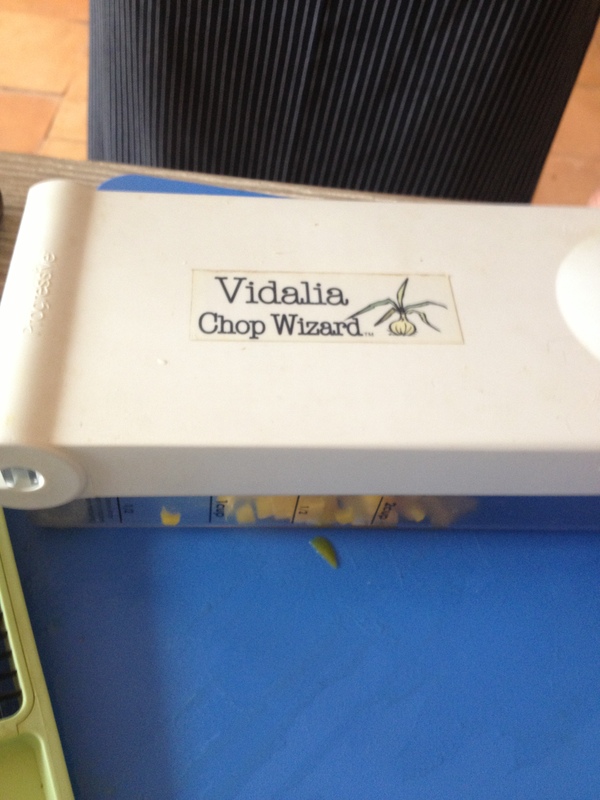 Sometimes known as a “slap chop,” he started by demonstrating that we could cut vegetables using this device with different blades to ensure uniform sizing and quick dicing. I have to say, he would make a wonderful spokesperson for the tool. While we were a little taken aback at first (“What is this? I thought we were here to learn to cook? !”), it didn’t take long before we saw the genius of the device. I admit, we did buy one back at home, and, well, I used it last night! 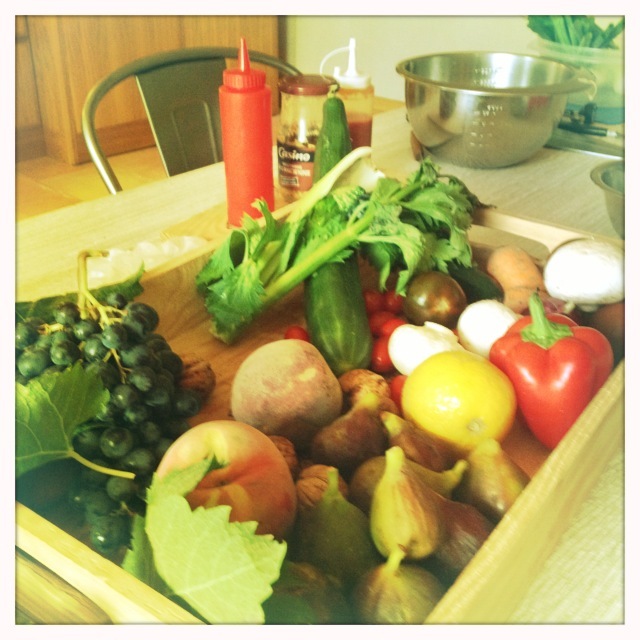 Beautiful fresh produce – perfect for perfecting our “slap chop” skills! 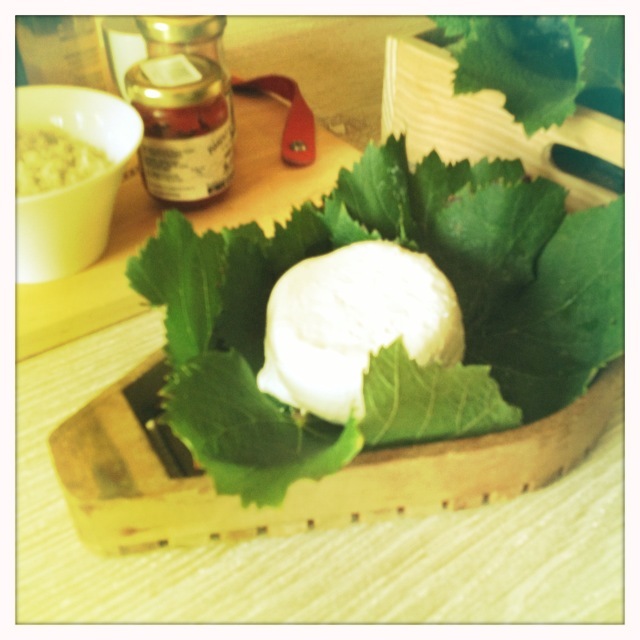 Delicious farm-fresh goat cheese for the tartare. All of that said, it was a funny ice-breaker, and we did go on to use our knives plenty. 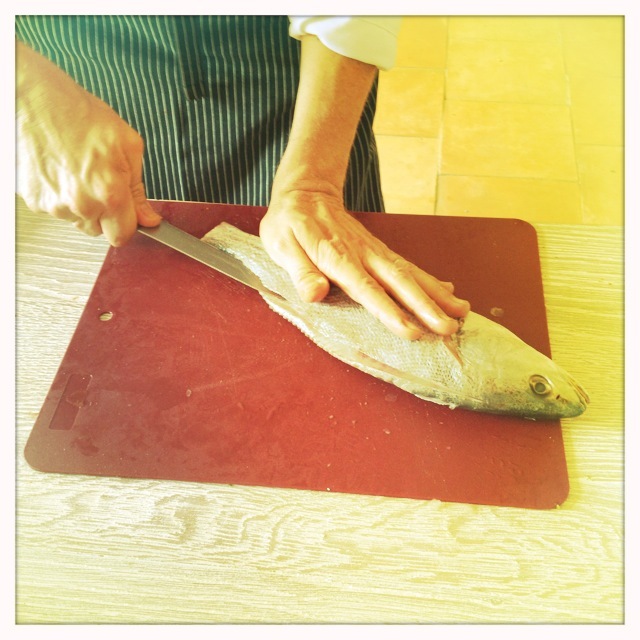 As a starter we made a fresh fish tartare, which he filleted with skill. 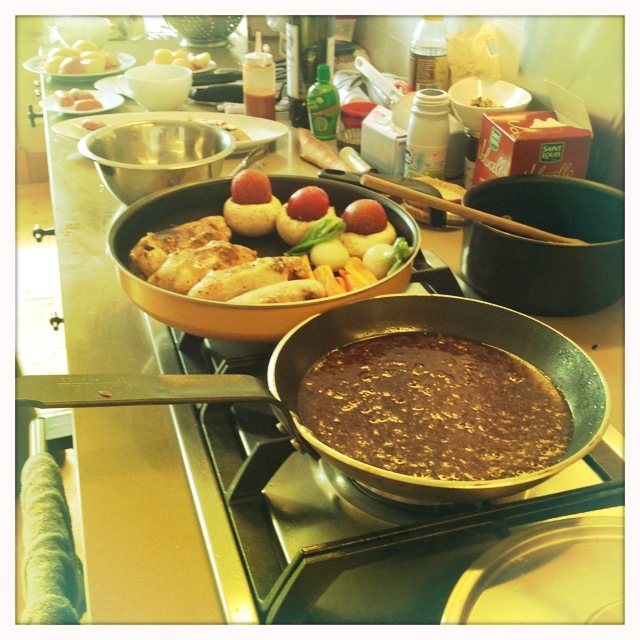 We used a variety of ingredients to mix our own sauces, and wound up in a taste test to see whose concoction was best. (We’ll call it a tie.) 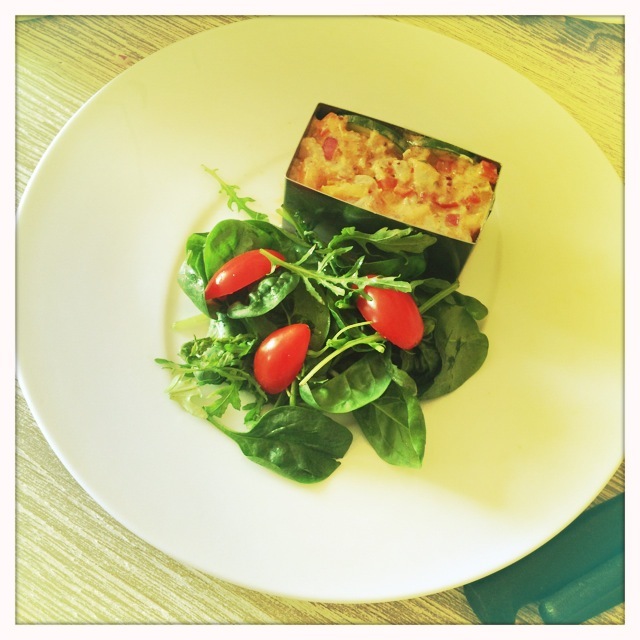 We formed the tartare into molds and put the finishing touches on a simple salad to accompany the tartare. Glad this wasn’t my job! 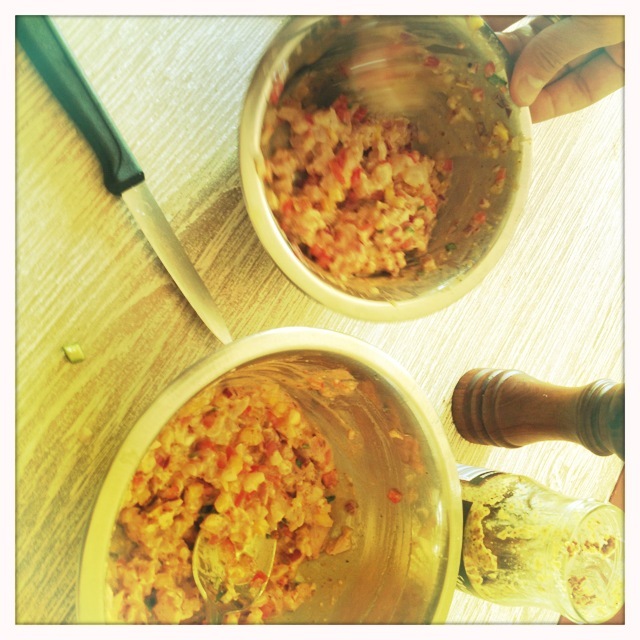 Whose tartare recipe wins? There WERE subtle differences. The finished tartare in molds, ready to be put in the refrigerator to set up. 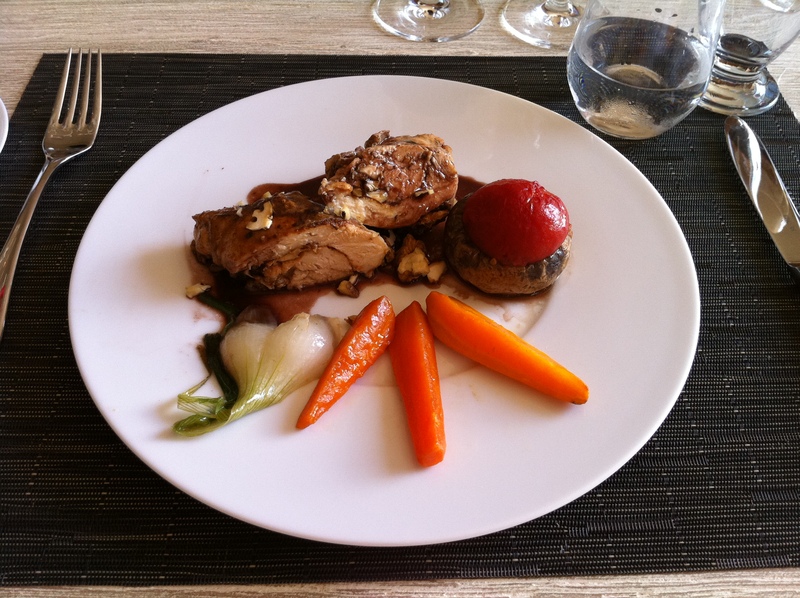 For the main course, we cut chicken breasts in half, coated them with this delicious spice rub, Epices Poulet Roti and stuffed the breasts with walnuts. (French friends, if you get me more of this spice rub, I would be so grateful! Friends in the States, if you know where I can find it here, let me know – I’m almost out of what we brought back!) 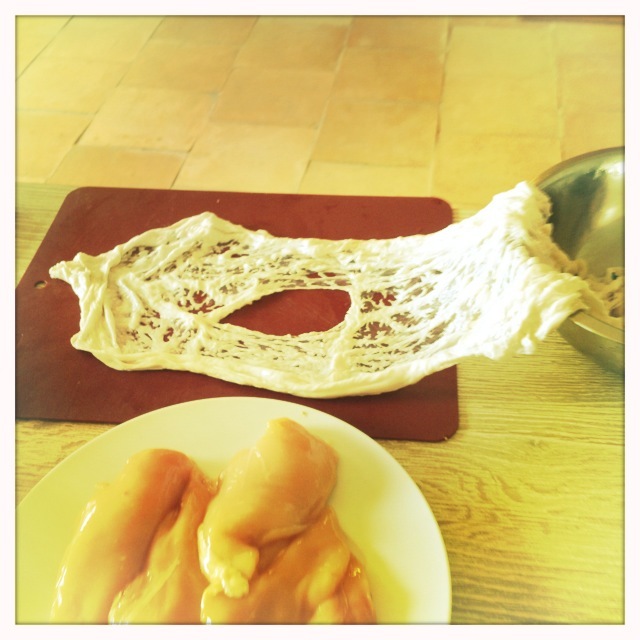 We then wrapped the chicken breasts in sheep’s stomach to hold them together for cooking. That was a first for us…! 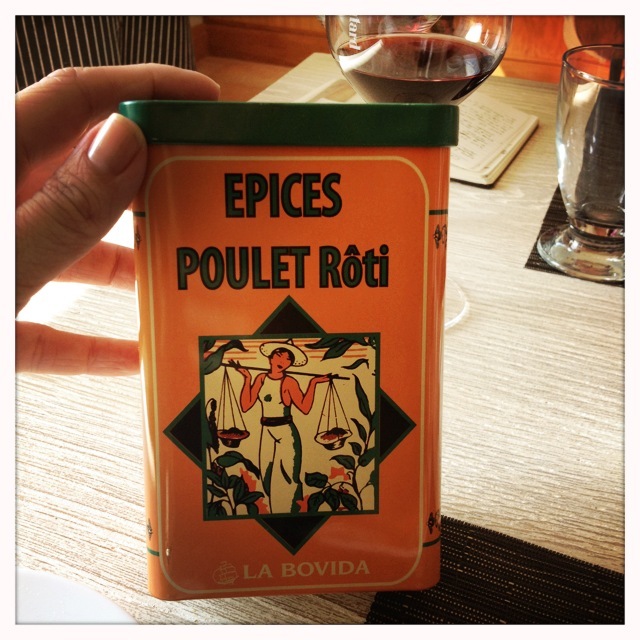 Epices Poulet Roti – I need more! Chef Phillipe had pre-made a divine red wine reduction sauce to go over the chicken, and we stuffed mushrooms with tomatoes and sauteed baby carrots to accompany the chicken. 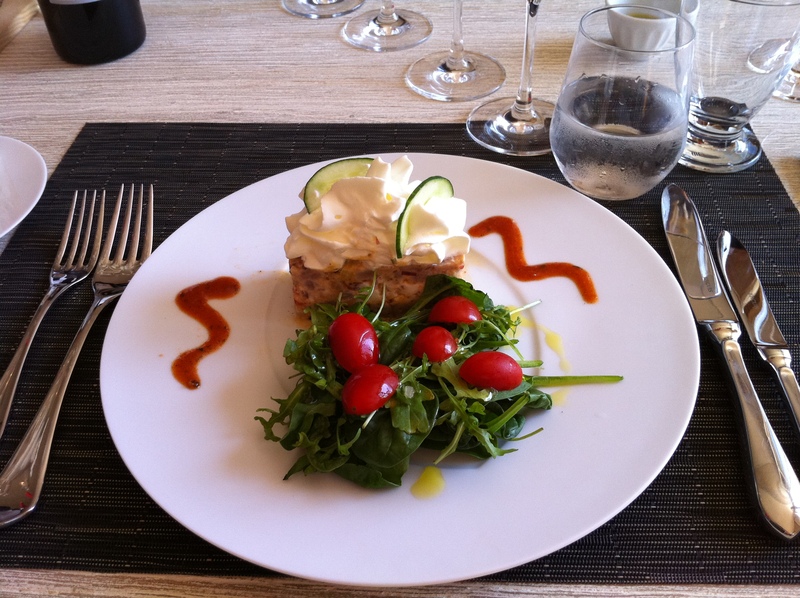 While we waited for the chicken to cook, we retired to the salon and enoyed a snack that Chef Phillipe had prepared. The chorizo on toasts was just perfect. The drizzle had just the right touch of spice – we were both eyeballing the last one and each other – we split it. More please. 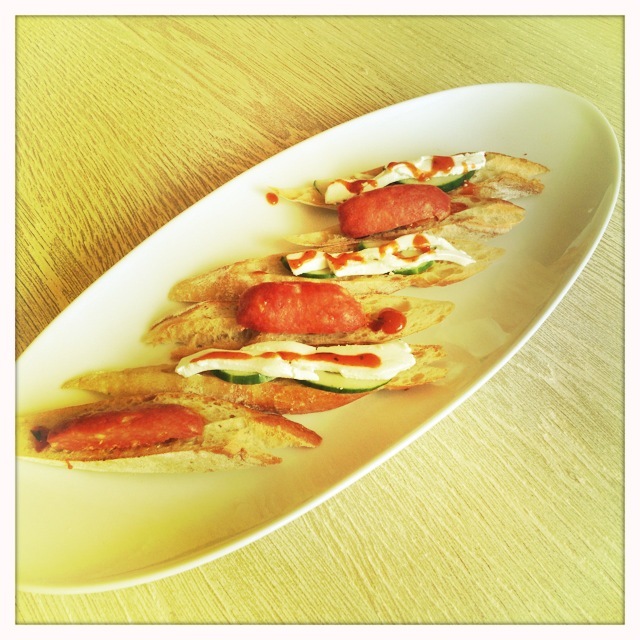 Toasts with chorizo and goat cheese. Pretty soon, we sat down to lunch. Despite our begging and insistence, Chef Phillipe would not join us at the table, so we enjoyed his creations and his company while he and his assistant kept busy prepping more food. The tartare was super-fresh and light and flavorful, and the salad was a perfect side. We also had two different vintages of Chateau Soutard with the meal. 2003 Chateau Soutard – Sweet dark red/black fruit, medium bodied and smooth in the mouth. Ripe blackberries with a lot of secondary flavors coming through, like spices and earthy forest floor. This wine has a medium-long fruit finish and seems to be fast evolving. I would drink this wine in the near term. 2005 Chateau Soutard – Nice perfume of flowers and dark red fruit. Tastes like a warm dark blackberry and black currant fruit pie. Slightly rustic flavors of dry leaves coming through in the mouth. Smooth and medium bodied and slight tannins present on the medium-long dark fruit finish. 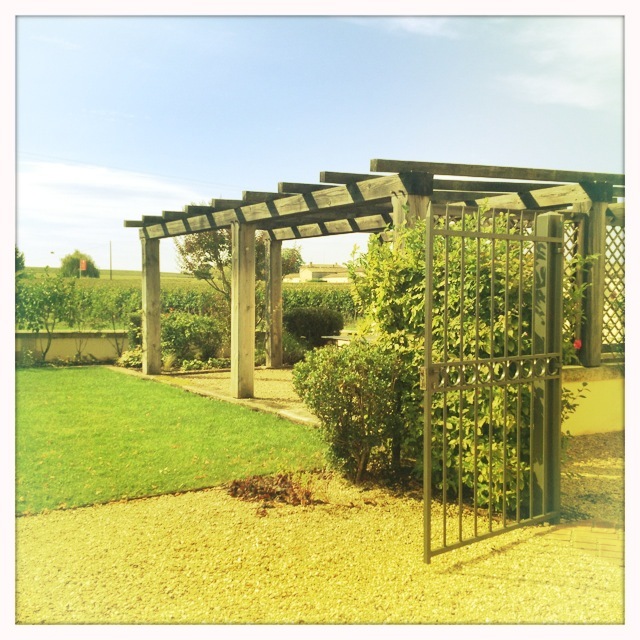 While enjoyable and good food wines, in general, the wines of Chateau Soutard don’t seem to have the elegance and polish that a lot of the other classified growth Bordeaux have. But now that Michel Rolland is on the scene, we’ll be interested to see how these wines evolve in the future. Fresh fish tartare with a simple side salad. The chicken, though simple, was superb – I have actually made it several times at home now. The wine that accompanied the chicken dish in particular was a great match – they had clearly thought through this pairing well. The chicken was deceptively simple and delicious. 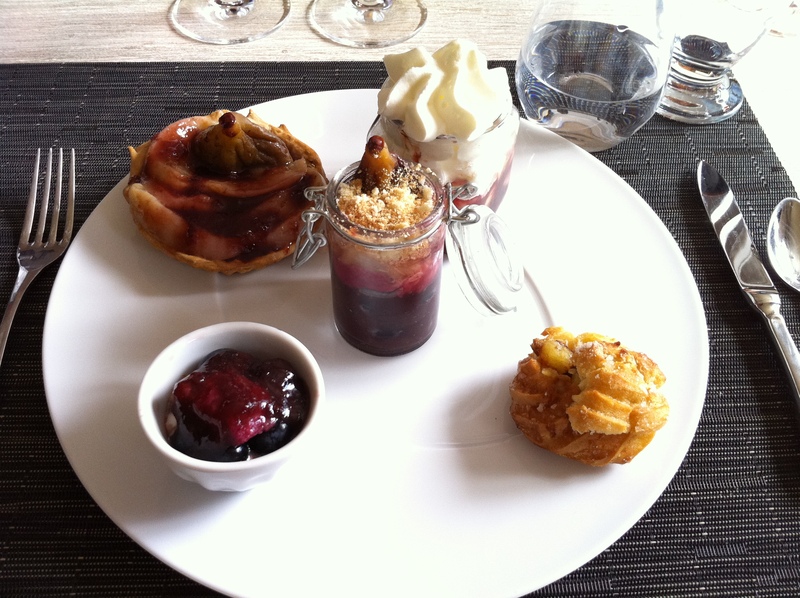 As if this wasn’t enough food, Chef Phillipe had prepared not one but FIVE desserts for us to sample. NOW we know what they were working on while we were eating away. Ooh la la, but they were good. You have got to be kidding me! So good! boߋkmаrked! !, I really like your site!